Some people literally wear love for San Francisco on their sleeves with Muni-related tattoos. There’s everything from an F-Market/Wharves PCC streetcar to a Fast Pass to the Muni worm. The owner of that Muni-worm tattoo, Muni Tattoo Girl, contacted us after that first post and sent us some more pics of her iconic neck piece. Tattoos being permanent and all (for better or worse), not everyone is willing to make the commitment. 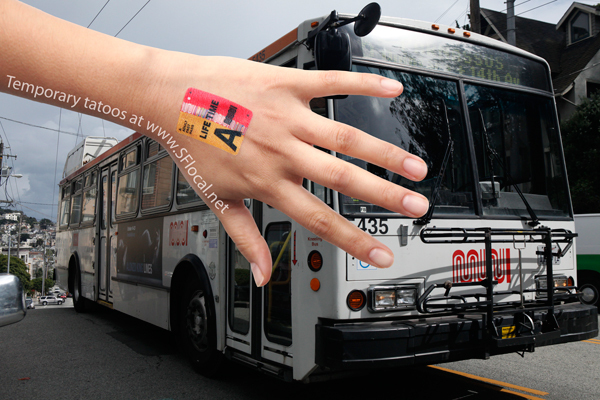 Enter temporary Muni tattoos, courtesy of SFLocal.net. The artist celebrated 10 years in our fair city this year. Fast Pass tattoos above go for $2.25 a pop. Get them — and other SF-related ones — at SFLocal or in the artist’s Etsy store.